Peter Craciun is the founder and director of Hummingbird Bike, which he started in 2016. He created his first bike for his girlfriend to encourage her to get into cycling. From there, he went on to design and create a very light folding bike utilizing a carbon fiber frame. There is also an e-bike version, which folds and is also very lightweight. He answered some questions about it for CleanTechnica. 1. What is the price and is there a warranty? 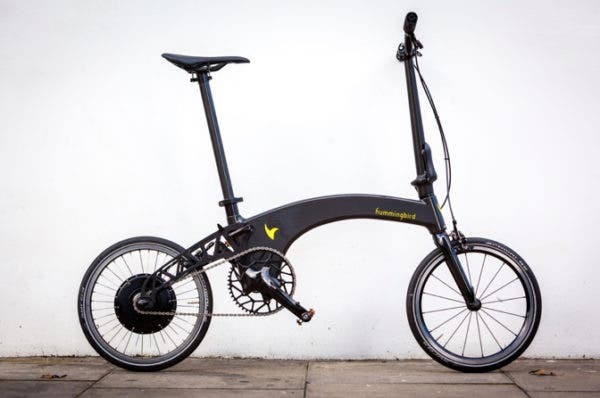 The price of an electric Hummingbird bike starts from £4,495. We have a 5-year warranty on the frame and a 2-year warranty on the bike components. The warranty covers any manufacturing defects with the bike. 3. Why would a rider want to connect a smartphone to the bike? The connection to a smartphone is not necessary to be able to ride the Electric Hummingbird, however, using your smartphone allows you to see the speed of your Hummingbird as well as check the battery charge and total ride distance. The app also allows riders to adjust the settings of their electric bike, such as maximum speed, and enables access to services including online diagnosis, mobility stats and other social functions. The smartphone app also includes an innovative security measure to lock the back wheel if your Hummingbird happens to be stolen. 4. How long does it take to charge the battery? The electric Hummingbird battery takes two and a half hours to fully charge, extremely quick for an e-bike, with other well-known folding e-bikes taking over four hours to fully charge – almost double the time of the Hummingbird! 5. Does the e-bike come with a charger? Yes, the electric Hummingbird comes with its own charger. The charger is extremely portable and no bigger than a standard laptop charger, making it easy for commuters to carry around with them. 6. Is it easy to take the e-bike on a train or bus one it is folded? Hummingbird bikes are very easy to fold and unfold and are extremely narrow, making them perfect for taking on public transport. The electric Hummingbird is also the lightest folding e-bike in the world at just 10.3 kg, making it the ideal commuter bike. 7. How long does it take to unfold it? After some practice, unfolding the electric Hummingbird can take as little as five seconds. The fold only involves three steps: unfolding the stem, pulling out the seat post, and flipping the wheel – then you’re ready to go! 8. What kind of battery does it use? The electric Hummingbird uses a Lithium Ion battery made by Panasonic. 9. What is the top speed? The top speed of the Hummingbird e-bike is 25 kph – which should have you zipping past traffic! 1o. What is the range of the electric motor and battery? The range of the motor is about 30 km, equivalent to about 20 miles, on full assist, and this can increase based on the rider and the settings they’ve chosen using the smartphone app.